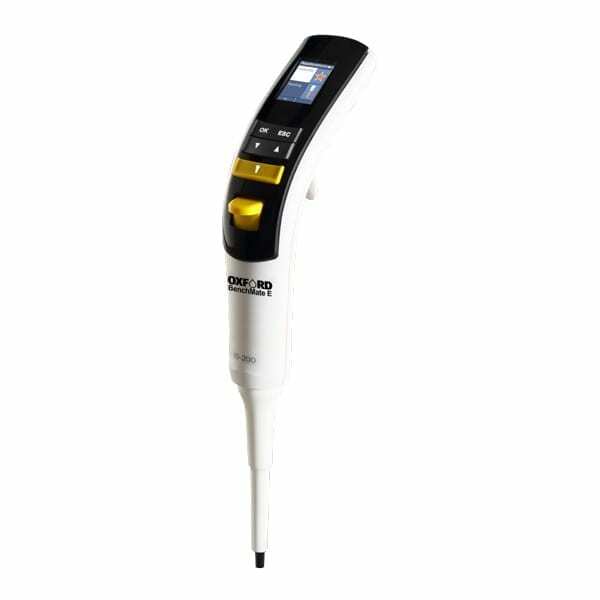 The Oxford Lab Products BenchMate Electronic Pipette is lightweight, designed for left-hand and right-hand use, providing comfort and versatility for scientists. This pipette from the Oxford Lab Products BenchMate line offers precise and accurate pipetting. 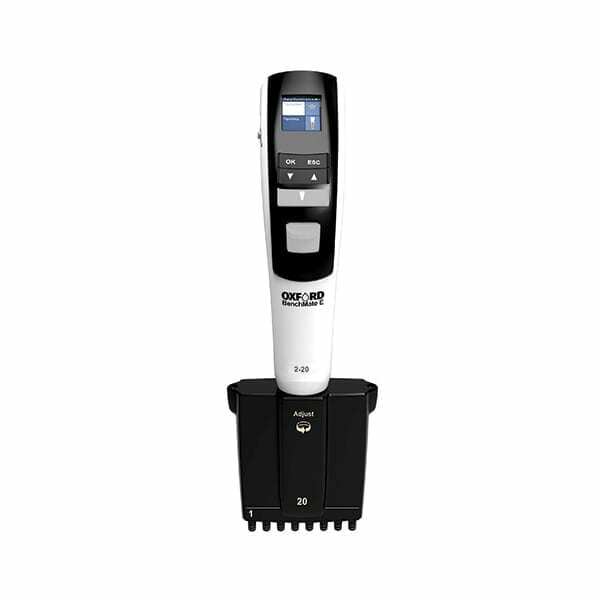 The Oxford Lab Products BenchMate Electronic Pipette is equipped with an intuitive graphic interface. Five different and frequently used modes of pipetting are available, including Pipetting, Reverse Pipetting, Multi-Dispense Pipetting, Diluting and Mixing. The high-performance stepper motor provides consistent and repeatable results. The unit provides secure usage, with password-protected calibration. This pipette has a lightweight and ultra-ergonomic design. It has a built-in power-save and Intelli charging battery, providing uninterrupted usage by scientists. Different pipette volumes are uniquely color coded for easy identification. The universal tip cone is compatible with universal pipette tips. The pipette has an autoclavable lower assembly and comes with a 3-Year Warranty. Besides these manual pipettes, the Oxford Lab Products pipette range also includes the BenchMate Single Channel and Multichannel Pipette and the BenchMate Light Mechanical Pipette, therefore providing scientists with more options. Intuitive graphic interface with a simple and easy to navigate menu and easy to understand, real-time process graphics. 5 different and frequently used modes of pipetting to suit various applications. These include Pipetting, Reverse Pipetting, Multi-Dispense Pipetting, Diluting and Mixing. The high-performance stepper motor provides consistent and repeatable results over time. Secure usage, with password-protected calibration, provides scientists with peace of mind. Lightweight electronic pipette with an ultra-ergonomic design for user comfort. Built-in power-save and Intelli charging battery, for uninterrupted usage. Volumes are uniquely color coded for quick and easy identification. The universal tip cone is compatible with universal pipette tips.